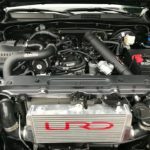 URD has released this advanced supercharger system for the 2016 and later Tacoma with the 2.7L 2TR-FE 4 cylinder engine. 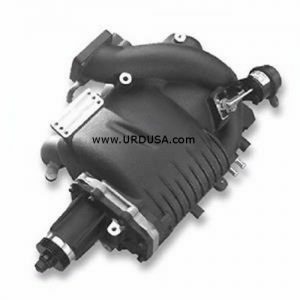 It is the highest performing supercharger system available for this application. This system uses a very large air-to-air intercooler to cool the compressed air from the supercharger for greater power potential. The mounting of the intercooler is high in the grill area to make it more compatible with off road winch bumpers. 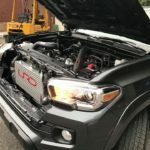 Our development vehicle was a 2017 Tacoma with the 2TR-FE 2.7L engine and a automatic transmission. The base line dyno using a DynoJet chassis dyno was 124 RWHP and 142 RWTQ. The after dyno was 198 RWHP and 207. Peak gain was 74 RWHP and 64 RWTQ. 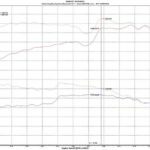 The Max Gain 76 RWHP @5017 RPM and 82 RWTQ @4980 RPM. 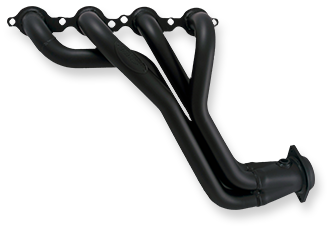 The Stage 1 system produces approximately 6 PSI of boost at sea level. 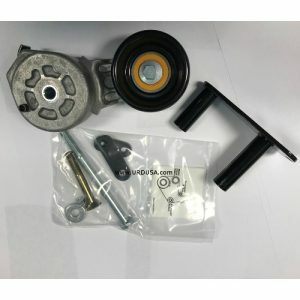 This kit is designed to fit the Tacoma PROPERLY and does not need any modifications for proper installation. The fit and finish on all the parts is second to none. URD has chosen the highly efficient Rotrex C30-94 supercharger as the center of this supercharger system. 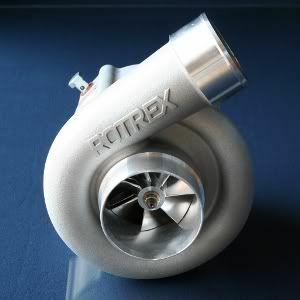 The Rotrex is most advanced supercharger design on the market today. 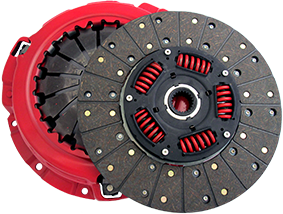 It features a small compact foot print with almost completely silent operation, with a very highly efficient traction roller drive system that will spin the turbo type impeller 9.4 times faster than the belt drive pulley is turned. This high step up ratio and small diameter turbo style impeller brings boost in sooner than other more common types of centrifugal superchargers. This gives you very nice off the line performance combined with unmatched top end power. The Rotrex Supercharger features it own self contained oiling system using Rotrex’ proprietary traction oil that is the key to the advanced traction drive system. Rotrex warranties their superchargers with an industry leading three year UNLIMITED mileage warranty. The air intake system brings in cool air from the stock location in the fender wall and into the stock air filter box. 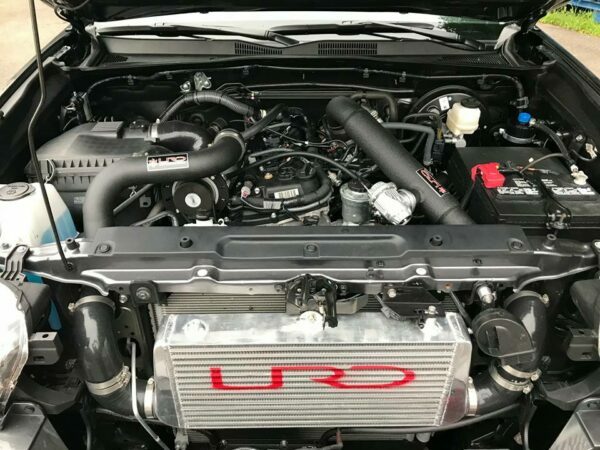 URD uses a custom made silicone adapter to adapt the air filter box to the supercharge inlet. The stock air filter box flows very well and it was retained to keep the system noise to OEM levels and allow you to adapt in a off road snorkel system if you want. The overall operation of the supercharger system is nearly completely silent, but we have added a turbo style blow off valve will announce that your Tacoma indeed boosted. When the throttle is suddenly closed when the engine is at high RPM like shifting gears with boost, the blow off valve will cycle with a very crisp note typical of high performance turbo systems. It is always a crowd pleaser!! The kit includes all the needed brackets, parts, and fasteners to allow a trouble free, no hassle installation. We include high quality stainless fasteners where possible, and all the parts have a high quality wrinkle black powder coating finish that will last and looks fantastic. The piping is all mandrel bent high quality aluminum they fit like they are supposed to. Only the best in kit components are used. 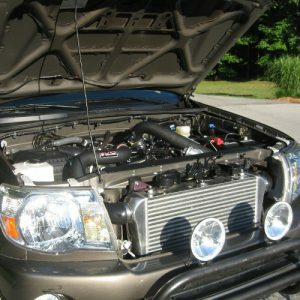 The installation on your Tacoma straight forward and the only modification to the vehicle require is some slight trimming of the radiator core support to pass the charge pipes through. No part of the kit runs under the truck or frame and the skid plates do not even need to be removed for installation. We made every effort to make the system compatible with off road winch bumpers. We can’ guarantee compatibility with all bumpers on the market, but several of our V6 kits have not had any problems with the different winch bumpers on the market. The 4 cylinder kit uses the same intercooler as the V6 kits so all bumper compatibility will be the same. Want even more??? The basic kit uses the Rotrex C30-94 supercharger, but we have designed in expandability for those that want to go extreme. The supercharger mounting bracket and belt drive is designed to accept any Rotrex supercharger in the C30 series and the larger C38 series to include the new “Big Daddy” C38-91. The larger superchargers will require a race built engine and your own engine management. 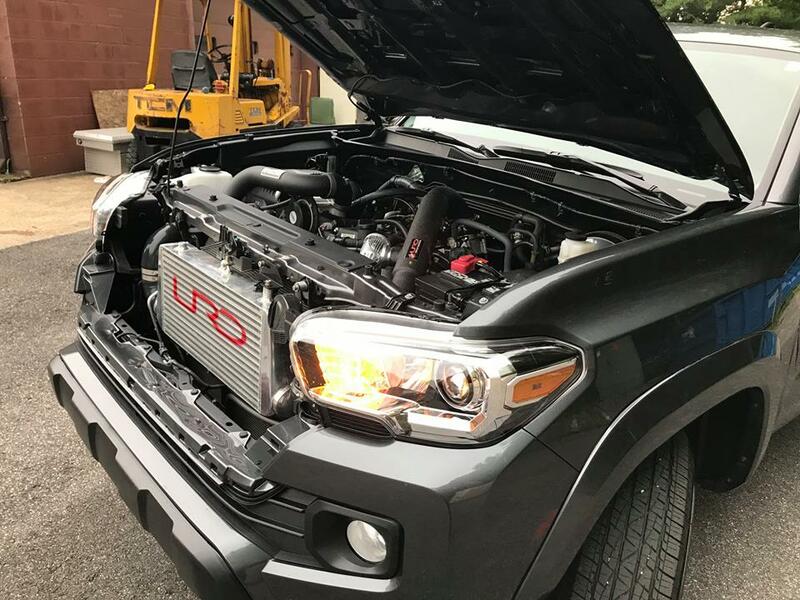 URD has worked very hard to bring you the finest supercharger kit for your Tacoma and we are very sure you will be very happy with it!! This kit is not CARB approved and is legal in California for off road and racing use only.